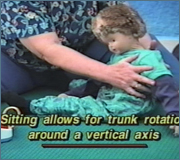 Beginning positioning and preparation activities for use in therapy and at home are demonstrated on a doll for clarity. Basic components of sitting and the beginning sequences of physical handling to provide security and stability are presented. Clinical application exampes are presented with child with various levels of disability.